It iThe mud, snow and ice that prevailed on the Eastern Front were tremendous impediments to travel and mobility. This was especially true because of the poor condition of roads in Russia. To help solve the difficulty that wheeled and half-tracked vehicles had in negotiating the terrain, Germany introduced the Raupenschlepper Ost, which literally means “Crawling Tractor – East.” The RSO was introduced specifically for mobility on the Eastern Front, and it typically served as a prime mover. The fully tracked chassis ran on a running gear of four steel wheels either side. Latterly, the RSO’s mission expanded because of a severe shortage of antitank platforms. 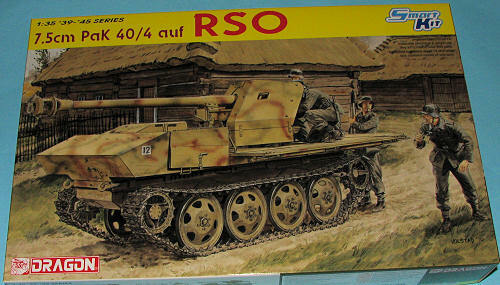 Thus, the RSO was eventually fitted with a 7.5cm PaK 40/1 antitank cannon. To facilitate its new function, the driver’s compartment at the front was replaced with a lightly armored superstructure. However, the weapon system overall was very vulnerable to enemy fire, despite all its advantages of mobility in treacherous terrain. The first such systems were fielded for evaluations by Army Group South in 1944, though full-scale production never really began. Instead, a mere 60 such antitank vehicles were produced out of a total of 23,000 RSO vehicles. When one opens the box, one can see that this is not a huge kit. Looking at the box art shows that this isn't a large vehicle. However, it is large in terms of detail. 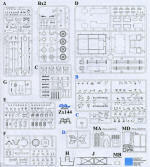 Of the 460 parts, a quarter of them have to be part of the individual track link suspension. Then the kit has a complete engine and detailed chassis. This detail extends to the PaK 40 gun and the complete driver's compartment, so you are definitely getting a lot for your funds. You'll find few options on this one aside from being able to mount the gun in the fighting or travelling position and there are some areas where one can substitute plastic bits for photo etch ones. I'll let Dragon cover the rest. 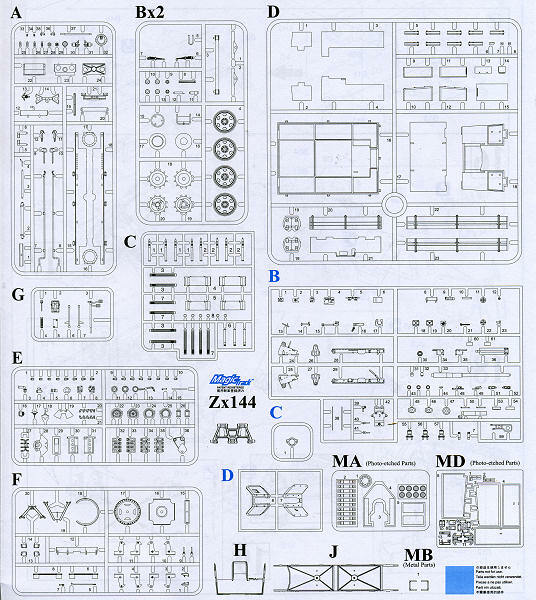 As usual, Dragon's instructions are superbly drawn and provide a lot of smaller detail sections. There are markings for seven vehicles in the instructions, most of them from the popular 'Unidentified Unit, Eastern Front'. Two of them are identified as Pz. Jg. Abt 152, 1.Ski. Jg. Div. , Eastern Front in 1944. The small decal sheet may go unused as most have no distinguishing markings aside from camouflage. Another fine and somewhat unusual kit from our friends at Dragon. One wonders when they will run out of subjects, but I bet it won't be for a long time. Thanks to www.dragonmodelsusa.com for the preview kit. Get it at your usual haunts.